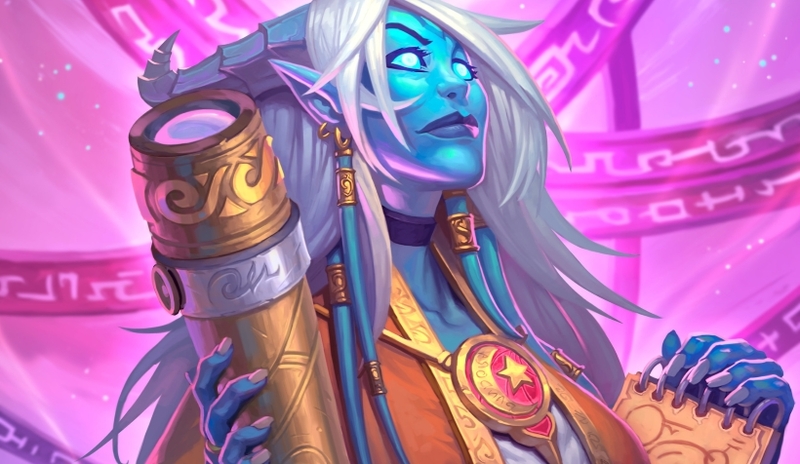 Our Tempo Mage deck list guide features the best Rise of Shadows deck list for Season 61 of Hearthstone (April 2019). Our Tempo Mage guide also contains Mulligan advice, card combos and strategy tips. Tempo Mage is a Hearthstone deck that's all about making full use of the powerful spells available to the class and squeezing out every last drop of value from them. With all of that firepower, you’ll be able to get far ahead of your opponents with smart plays, while blasting away at their health pool with big damage spells. Your greatest strength is the sheer power and frequency of those spells, which you can buff even further with all the additional Spell Damage cards in the deck. Whenever other players try to establish a position on the board, you can just as quickly obliterate them as you stretch even further into the lead. In our Tempo Mage guide, we're going to be looking at a theorycrafted deck players are considering to run in the early days of the Rise of Shadows meta. As this is a classic archetype, we’ve got some general strategy advice on how to pilot the deck, as well as some tips on how to deal with certain deck types you may face on the ranked ladder. If the deck proves to be a strong choice in the new meta, we’ll return with more in-depth pointers and Mulligan suggestions. Here's a version of Tempo Mage created by Alliestrasza during the Rise of Shadows pre-launch. It’s by no means the definitive version of the archetype so expect to see some refinements over the next few days. We’ll be keeping this page up to date as soon as they happen! The goal of Tempo Mage is to contest for the board early on with minions, use an entire tome’s worth of spells to maintain that position throughout the game, and then finish off your opponent using burn damage. The deck has answers to practically everything, and simply denies any opponent at every turn – whether they’re playing minions or spells – to prevent them from finding a foothold in the match. Early game: Play it cool on your early turns as you gather together a few minions and spells that work well together. If you just drop cards such as Magic Dart Frog or Mana Cyclone onto the board freely then you miss out on a significant part of their power. What is worth freely using is some of your cheaper damage spells or hero power to remove enemy minions from the board, as maintaining control is very important for the deck’s success. Mid game: Maintain further control over your opponent’s board and shut down every single one of their actions. Again, instead of playing minions on curve, look for ways to combine them with some of you inexpensive spells a turn or two later to get value from cards such as Vex Crow. You also have a surprising amount of area of effect damage in the deck to clear wider boards when you look at combining your Spell Power boosts with cards like Cinderstorm. During this part of the match, Tempo Mage can start to look thin on resources, so use Stargazer Luna to dig deeper into your deck or hold off for a Mana Cyclone after you’ve played many spells in a single turn to easily refill your hand. Late game: At this stage of the game Tempo Mage can really start to fade off, so now’s the time when your really want to find that last bit of burst damage to finish off your opponent. Pair up your Fireball spells with all the Spell Damage in the deck for a massive hit to their life total. Elsewhere, Archmage Antonidas can help with this a lot, as long as you have a chain of cheap spells ready to go once you’ve slammed him onto the board. You can also try experimenting with Khadgar to establish a wide and powerful board late in the game. A couple of your spells and minions summon additional creatures, so look to activate their effects with Khadgar on the board to find a few minions out of nowhere for a substantial tempo play. 1. Let them play multiple minions onto the board before you worry too much about removing them as you have so many spells perfect for the job. 2. Pairing some of those cheap spells with Magic Dart Frog is a perfect way to eke out some extra points of damage that will clear the board cleanly. 3. Similar, your Spell Damage bonuses are excellent alongside Cinderstorm and Arcane Missles for wiping out wide, low-health boards. 4. Use your spell Discover effects to find the exact answer you need at the right time, or grab another area of effect spell as you know that’s always going to be useful against aggro. 5. If you’ve built up enough burst don’t be afraid to send it to their face sooner rather than later. Aggro decks run very little healing and you might be able to win in a race. 1. Take even more time to set up your powerful card combos against control as you won’t be under as many constant threats. 2. If you try to establish a wide board using Khadgar, be aware that you might run into your opponent’s area of effect removal, so don’t commit too hard to a single play like that. 3. It may be tempting to launch burst damage their way while you can, but against control it’s usually best to save it until you know you can deliver the killing blow. It’ll surprise them and not give them time to prepare Armor or healing. 4. Conjurer’s Calling is always best used on your own minions, though in a truly desperate scenario against a very dangerous card you can use it on one of your opponent’s minions. You might make the problem twice as bad, though! 5. Once they’ve gathered you’re Tempo Mage, most control decks will save some removal for Archmage Antonidas. Because of that, wait until a turn when you can get the most value out of him and then pull the trigger. We’ll return to update our Mulligan advice for Tempo Mage once a more stable and refined deck list has come to light. - Remember to double check your maths while any Spell Damage cards are in play. It might be the difference between wiping the board or leaving a minion on one Health. Or, in the worst case, between victory and defeat. - While a card like Kirin Tor Tricaster is great for the Spell Damage boost, do remember that it also increases the cost of all your spells by one mana. Don’t make a counting error and cost yourself a good play! - You can pair a lot of cheap spells with Mana Cyclone as an excellent way to refill your hand with many additional resources. - While on the board, Sorcerer’s Apprentice reduces the cost of all spells in your hand by one. Use this to combo more spells together at once - and even cast some of them for free! - Stargazer Luna will draw you an extra card every time you spend the card that's currently furthest to the right in your hand. - To get the most use out of Khadgar, ensure the legendary Mage is on the board when you’re about to cast Conjurer’s Calling or use Vex Crow. That way you’ll generate many more bonus minions. I've been having some success with this modified version of this deck. I think the addition of Kalecgos to this deck is a powerful endgame play, paired up with Archmage Antonidas, made even better if you can lower him to one cost by getting a pocket galaxy from the Mana Cyclone.